On Thursday, Sims who can allegedly be seen on video dragging the driver from the SUV and beating him , was indicted. Investigators continue to work to find out what roles other members of the gang may have played in the attack on a New York highway. Braszczok also appeared on Friday but covered his face with a hoodie on his way in and out of court. He is next scheduled to appear in February after he testifies before a grand jury. Caldwell was similarly not indicted and will appear before a grand jury next week. Suspect James Kuehne appeared in court on Thursday, as the one who allegedly hit Mr Lien repeatedly with his helmet. He has pleaded not guilty. During the chaotic incident, Alexian Lien ran over biker Edwin Mieses in his SUV. The biker was left with spinal injuries and may be paralyzed. Lien said he feared for the safety of his wife and two-year-old daughter who were in the Range Rover. He has not been charged with any crime. 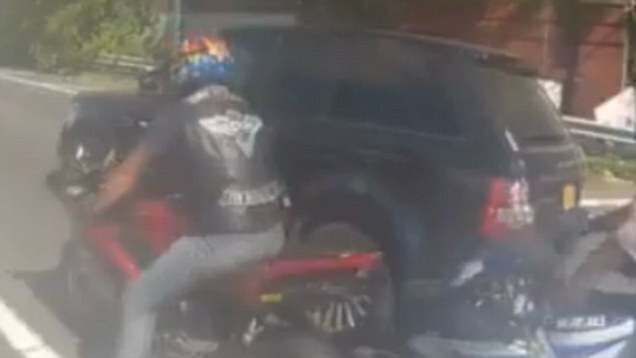 The developments came as another NYPD officer reportedly came forward and admitted to being part of the biker gang, it was revealed on Thursday. Matthew Rodriguez, 28, who is assigned to the Internal Affairs Bureau (IAB), only admitted being part of the ride a few days ago, according to a DNAinfo report. It is unclear whether the five-year veteran played any part in the violence against SUV driver Alexian Lien. Rodriguez is part of the division which is currently investigating those involved in the attack. Detective Braszczok, 32, is charged with gang assault in the first-degree, assault in the first degree and criminal mischief in the third degree over his alleged role in the incident. His lawyer insisted he would be exonerated by the very video prosecutors claim incriminates him during the September 29 attack. Mr Arlia said the video clearly shows Braszczok did not participate in the eventual attack on the SUV driver and was nowhere near him. Braszczok hasn't been charged with assaulting the driver, Alexian Lien, who authorities say was pulled from his Range Rover and beaten on the street by other motorcyclists.